Why is this website called “By the Onion Sea”? I consider “onion” to be emblematic of Russia. In addition to being one of the ten main Russian foods, onions are brought to mind by the dome of every Russian church. 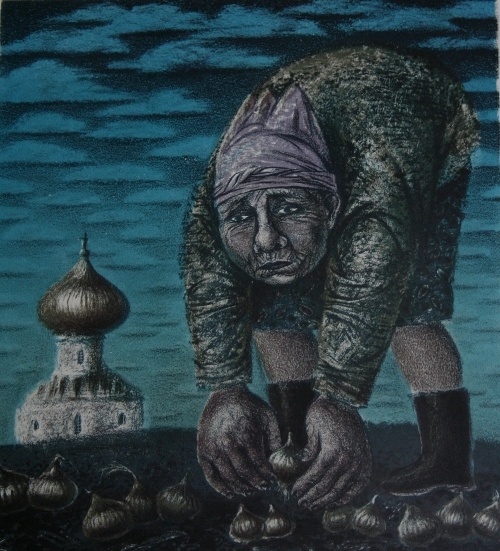 On the wall of my office, I have a lithograph by Tatiana Kozmina, a Russian artist I like, called “Lukovka” (“Onion Head”). Grushenka then says that “in my whole life I’ve given just one little onion,” and the theme goes on through the whole book. “I may be wicked, but still I gave an onion” is considered one of the most famous quotes from Dostoevsky (translated by Richard Pevear and Larissa Volokhonsky). I found an English idiom “to know one’s onions” – that means “to know one’s stuff.” Now, don’t you know your onions?